Into week 5 now I think, haven't had much to update. 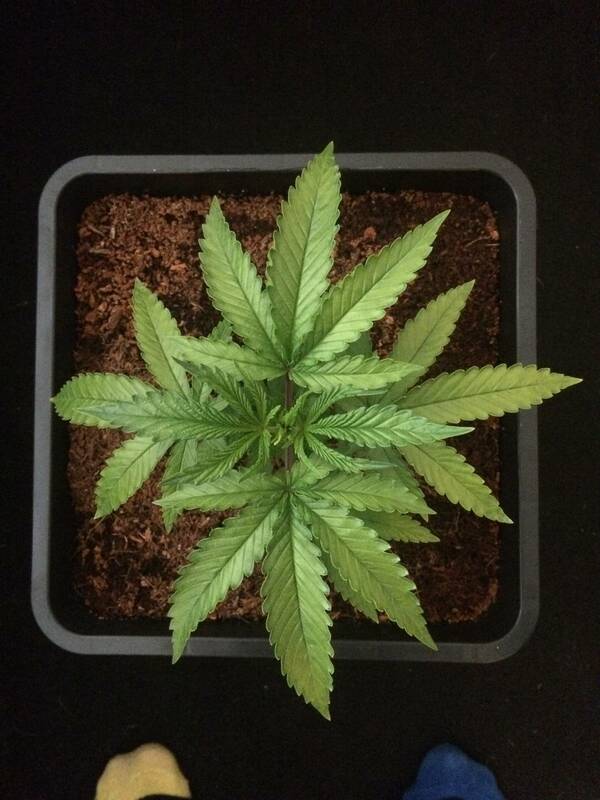 After last post it stopped responding and wilted, I fully flushed with ph 6 water and started to slowly up the feeding after that, at 1/2 strength 2ml/gal at the mo, runoff is around ph 5.5-6. Still on canna a+b nothing else other than a tiny bit of raw silica the other week before the flush. Will start using that again soon. Still going slowly but she's hanging in there. 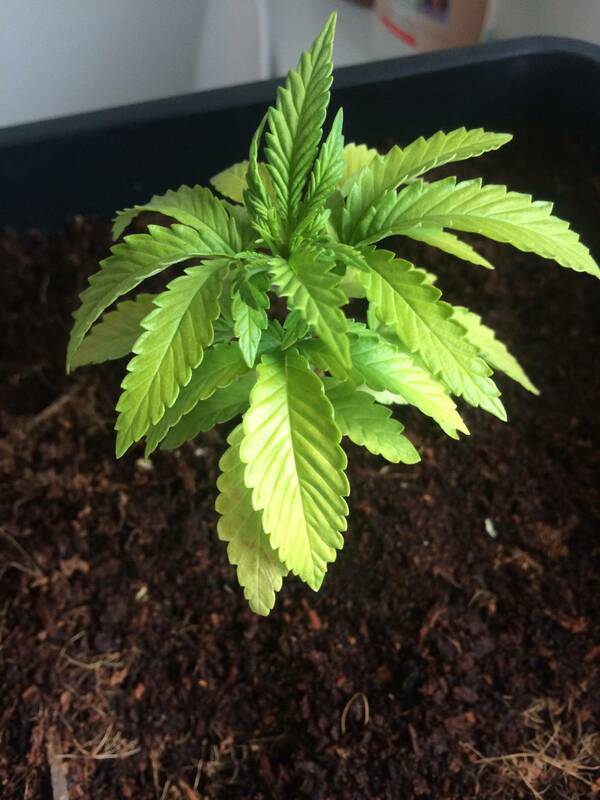 Looks like there could be a deficiency (want to say nitrogen?) and the tips of leaves keep poking downward. Humidity is between 45-55, temps range between 25-29C depending on the day. Sometimes I switch off the extraction and leave the zip door open with oscillating fan on to stableise temps on hotter days. Giving more regular feeding now as she seems to stop responding after 3-4 days. I would give it a full strength feeding next time. Canna is very forgiving. It looks good other than needing some food. Something like Rhizotonic will help develop the root zone and overall plant health. An enzyme product will keep the root zone clean so the nutrients you feed will be more accessible and will make it easier for the water to soak in properly. Big Time Enzyme is what I use with good results. Cool, I'll have a look at those, what about the raw silica, you think I should keep using it? I've checked my local water and it's classed as moderately soft with 35mg/l of calcium and 2mg/l of magnesium. You think it's worth adding some cal mag too? Does the raw silica dissolve? Silica cant hurt some debate on level of effectiveness. Does raise ph so can use for that. The way I look at it is if plants use so much silica wouldnt the coco have decent amount? Soiless mix have perlite which is silica... silica in nature is basically insoluble or glass would disapper and beaches wouldnt be sand as silica is the least soluble common element on earth. Some plants like horsetail do have silica. Silica is generally stable isotopically so doesnt even exchange O2 ie can do stable isotope readings on 50thousan year old silicious diatomes. Furthermore silica is utilized more in grass tyle plants like monocotyledon ie 1 seed leaf and mosses amd the like that live on rocks where there is a reason why they want to break down sand and rocks.. speculation. Sorry for rant.. anyway use it if you have it. Next time can just add diatomacious earth and perlite and see if you notice a difference. Dont use to much or inhale glass lol jk.. Since not really much science it sort of appears it has similar action as SAR and probably functions similarly.by Causing damage reaction in plants. But dont think anyones figured it out ezactly. Evidense it does work particularly in corn or bamboo type crops. Which like horse tail sorta makes sense as animals dont like chewing sand...although native americans uses horsetail as a toothbrush. You can still use calmag as having 25ppm is low and not sure if using nutrients that have ca in them?? If not 150ppm of calcium i think is about normal range for hydroponics so adding more is cool. 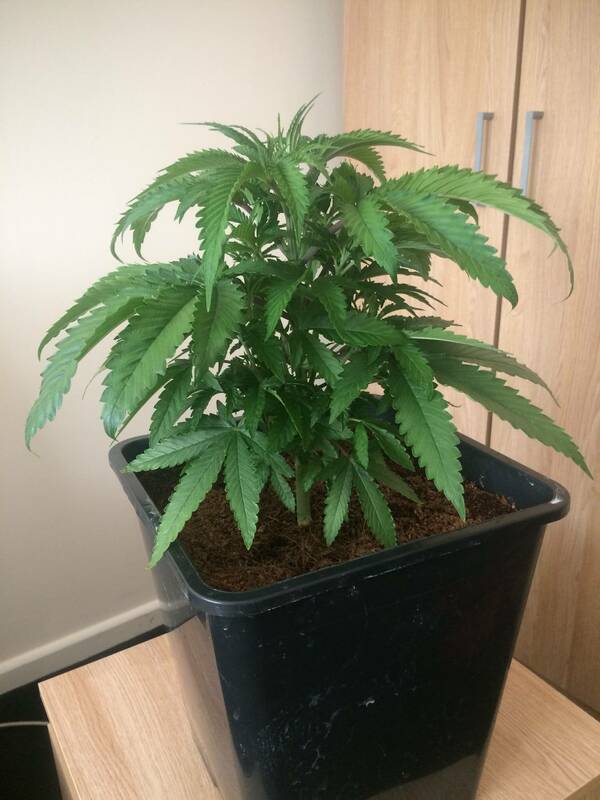 Thanks for the input guys, some food for thought on the next grow, might get a little experiment going then. Don't worry about the tangent theman it's cool. The silica makes the water a tad cloudy and forms some grit on the bottom, still haven't added it in, not really sure the best way to go about it, either spray it or add it to the water when feeding. I've read quite a bit on people raving about it so thought I'd give it a shot, apparently it's good for pests and I've had a lot of them on some of my chillis and herbs recently. So I took phycs advice and upped the feed and she's looking better today. Ahh ok so you dont have the soluble silica. What you have is just diatomaceous earth esp since says good for pests 25 kg bags are 15 bucks at seed and feed just fyi for next time. Dont have to use that diatomaceous earth every water or even every feed. Few times will be lots and can sprinkle on surface. If you use to much it will clog up the surface and make it harder to water. The raw silica is 60 to 70% soluble. Can be used folar or root. It's also Ph neutral. It can be used right up to flush. I personally wouldn't use more than 1/4 teaspoon per gallon with feed and 1/32 teaspoon. per gallon in Folar spray. Diatomaceous earth or raw silica can be sprayed on leaves which may help a little in bug control but wont be absorbed. And u do not want to spray that on your flowers so just clearing tgat up!! Can add to watering forsure if u want. Prob best just to use as amendment instead of watering with it. You got me this time. I should have checked my sources first. Also note I'd never Folar feed any plant passed the third Week of flowering. Ahhh! Thanks for clearing that up guys. I was really confused about the solubility as they say it's non cloudy and soluble and also say it's suspendsble in water, however it is ph neutral which I've checked. To be honest i should have looked into it more and done some research. After using it it does look like it's got a coating over the leaves and they've got the faintest shine to them, definitely going to experiment with and without on my next run. I added juuuust under 1/8th of a teaspoon to a gallon. 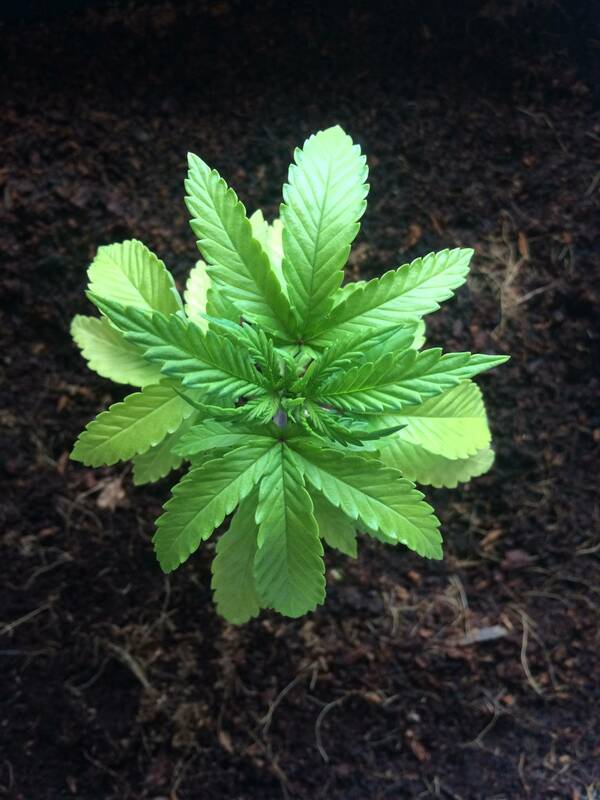 The very tips of a fan leaf look like they got burned so I think I'll reduce calmag to 1ml. Other than that she's not looking too bad since last week. Still some things to sort out climate wise. I have it about 15" away from the light, you can see the leaves slightly curling up, there's been a few hot days so I'm wondering if it's the response from heat stress or adding the calmag. Sorta looks deficiency there. Ur ph good still i guess is looking better eh. Just curious how you have been mixing ur nutes? Mix a and b then add water. Calmag into a and add water? All cal mag will have nitrogen its epsum salts and calcium nitrate. Nitrate gicing that nitrogen. Its standard in hydro nutes and why hydro nites come in 2 part formulas. Calcium nitrate in micros would react if mixed together in concemtrarion. Duh yea that's obvious now you say it. You will have to bear with me as I'm clueless. 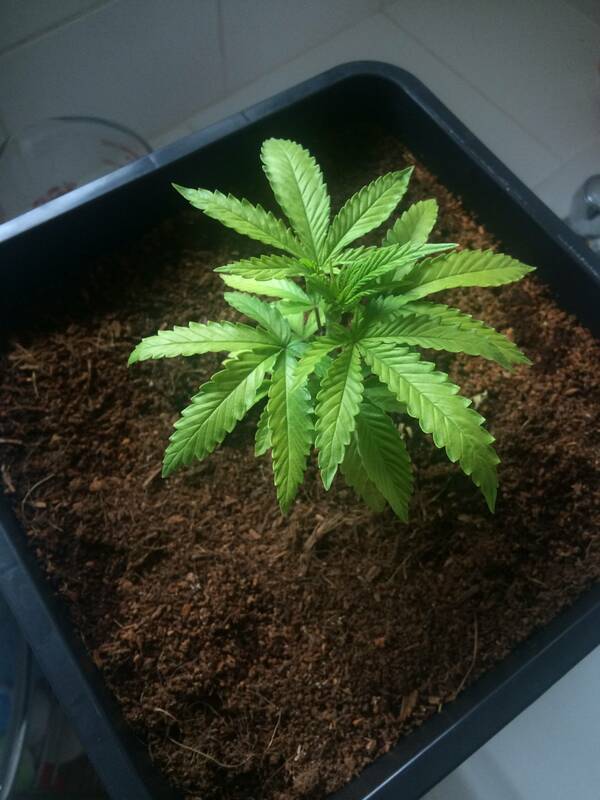 The method of mixing is gallon of water, add a, then b, cal mag, cannazym, rhizotonic, ph down. Ok just wanted to make sure u were mixing directly into large amount of water. And no cloudy precip forming. 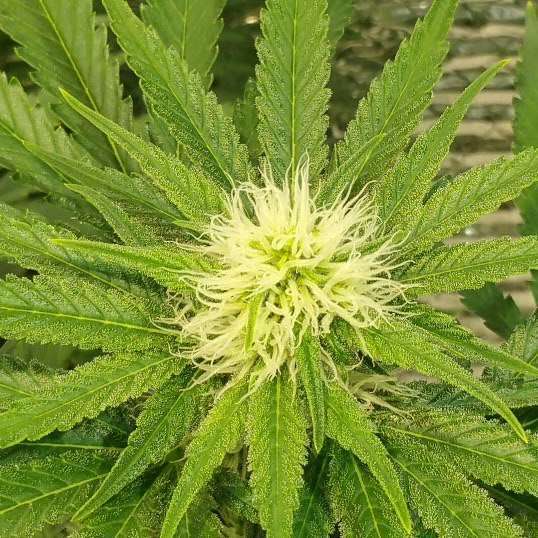 You prob dont have to mix cannazyme until large plants in flower. Not sure what rhizotonic is about but imagine mycoryz type product. Again once innoculated shouldnt need it more then few times. Also be sure to dechlorinate your water as often has enough chlorine to kill alot of the bennies. Best is let sit out overnight. Do not use fish dechlorination products. You might have to use chems to remove chlorine if the local water supply is using chloramines to do their water purification. It doesn't gas off like standard chlorination. The better products remove the chlorine and the resulting ammonia by-product of the process. At least that is my understanding as it goes from information I have gathered from cultivation sources, as well as from my old fish tank days. I don't usually let water sit out, if i do it's only for a few hours, always make sure it's luke warm though. I've herd mixed things about letting chlorine evaporate, yea I've herd it depends on the type of chlorine added in drinking water, also does anyone know the toxicity levels of chlorine for plants per litre of water? 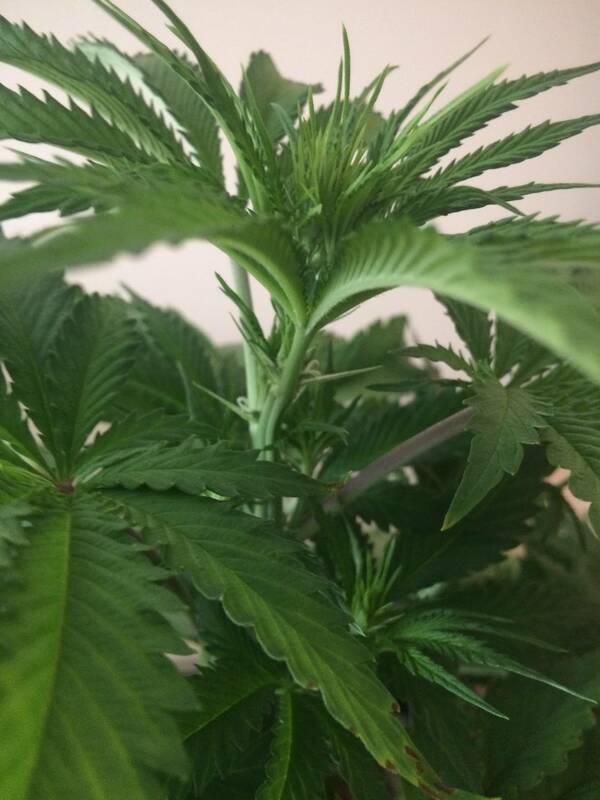 So I'm switching to flowering today, she's showing a bit of nitrogen toxicity I think judging from the curling of the leaves. Thanks man, I usually water to 20% runoff, I flushed and gave a light feed. I've started to leave the water to sit out over night and looks like it's responded quite well to it, also I think I've been watering too acidic so might explain some issues. 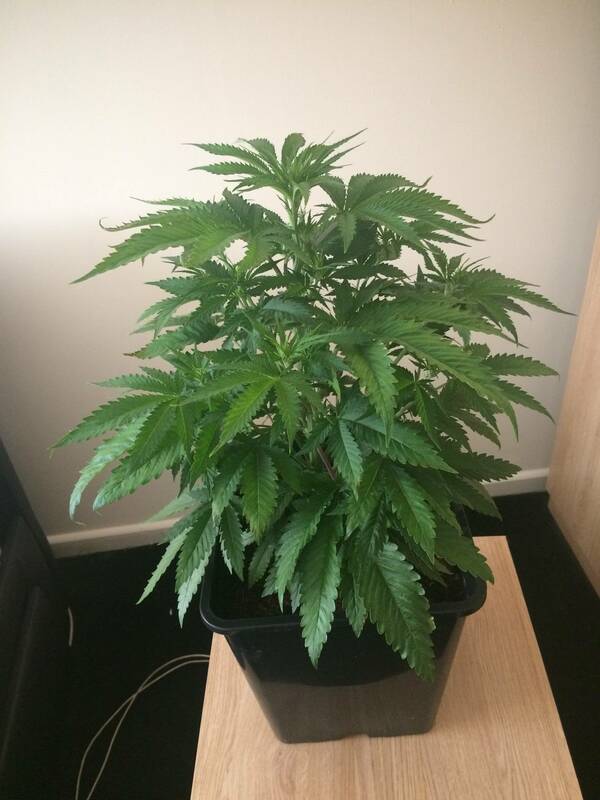 First week of flower is over, I burnt it a little mid week after not paying attention to my measurements, thought it was a gallon but turned out to be 3 litres! Dam she is bushy! Looking good don't sweat a little tip burn . She looks pretty green too so you could probably cut back a little on nutrients (make it weaker) . But don't cut back on watering tho. I will increase my runoff to 50% very few waterings just to keep the media clean . Starting out right this year...Kinda... Inverted's Grow Journal! 8,285 topic views. 0 members, 21 guests and 32 web crawlers are browsing this forum. Generated in 0.028 seconds spending 0.002 seconds on 17 queries.